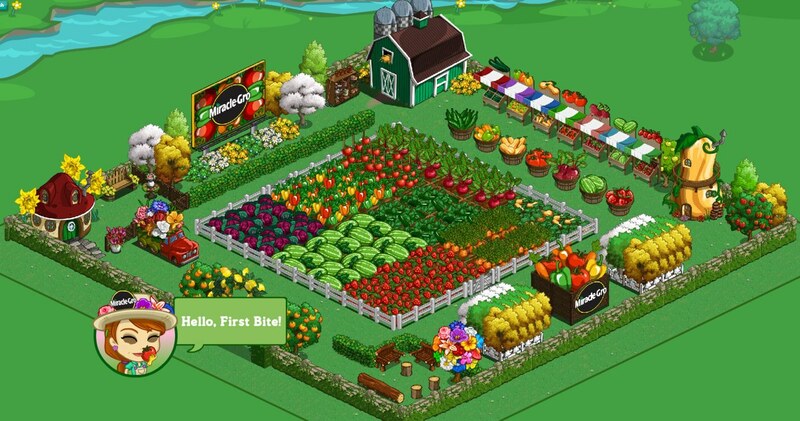 As we told you earlier this week, a new sponsored farm has started rolling out to FarmVille players this weekend, as Zynga has partnered with Miracle Gro to advertise the gardening solution via an entirely themed farm. The Miracle Gro Farm can be found at the very front of your in-game friends list, and by visiting it, you'll be asked to "Sprinkle Miracle-Gro!" on the crops that are currently growing. In a few seconds, this new farm will sprout with all sorts of crops, and you'll then be asked to travel to the Miracle Gro Facebook fan page in order to see your rewards. Of course, we'll tell you what they are without that extra step. For completing this short step, you'll receive a Giant Miracle-Gro Tomato Tree for your farm, along with a bottle of Miracle-Gro Insta-Gro to be used on your crops. If you do Like the Facebook fan page (as you're heavily encouraged to do), you'll apparently be eligible for more themed rewards in the future, although details about those items are unknown as of this writing. Fortunately, this promotion is available worldwide, and not just to players that live in the US. If you have trouble receiving your items, or are otherwise told that you're not eligible, make sure to refresh your FarmVille game and check your gift box as the prizes should be there. If not, contact Zynga Customer Support and they should set things right. We'll make sure to let you know if Miracle-Gro sponsors any further promotions in FarmVille, so keep checking back with us! What do you think of the prizes offered via this Miracle-Gro cross promotion in FarmVille? Sound off in the comments.